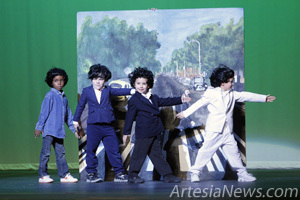 Artesia Public Schools students replicate The Beatles’ famous “Abbey Road” album cover during the National Dance Institute of New Mexico performance Friday at the Artesia High School Auditorium. Children from all five of Artesia’s elementary schools and Grand Heights Early Childhood Center as well as a few teachers participated in the show, which featured a live band and numerous classic Beatles songs. This is the seventh year the NDI has presented a performance in Artesia. The annual event is made possible through a grant from the S.P. and Estelle Yates Family Foundation.